Cover Color: Please Choose OneBlackBrownHot PinkRoyal BlueRed Design Choice-in place of a monogram: Please Choose OneNoneChristmas TreeMartini GlassSea ShellsBirthday Hat-Blue/GreenBirthday Hat-Pink/GreenAmerican Flag Optional Matching Ribbon: Please Choose OneYesNo Additional Liner: NoYes(+$29.95) Name/Monogram: First Line Personalization: Second Line Personalization: Font Type: Please Choose OneNoneDiamond MonogramCircle Script MonogramFishTail MonogramBlock8Block107Script10Script51EScript51A#15A Font#40 Font Thread Color: Please Choose OneNoneWhiteHot PinkRedLime GreenRoyal BlueKhakiBlackBrownYellowLight PinkGreenBlue Who is this item for? Lisa's Unique Creations' exclusive Ice Bucket with Personalized Neoprene Cover. 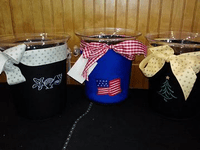 Fun and trendy these Lucite Ice Buckets with Personalized cover make a great gift for a number of occasions. Add a second cover to mix things up! Perfect engagement gift, one with couple's monogram and one with our 3 shell icon! If you choose an optional ribbon around the top we will choose a fun coordinating color to match your thread. 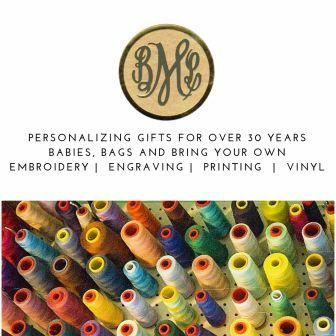 Personalize it with a monogram, name or phrase/theme of your choice. You may only use two lines up to 10 characters (including spaces) per line regardless of whether you choose a name or monogram or phrase. Also be sure to complete the "who is it for" section. 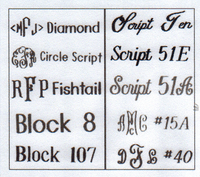 Or, pick from one of our fun designs and put a single name underneath it! For more detailed information regarding how we embroider please see the Personalization Page.If the "who is it for" full name does not fit in the space allowed please spell it out completely in the comments section.